Apple Cabbage Slaw recipe by SumeraNawed at DesiRecipes.com. 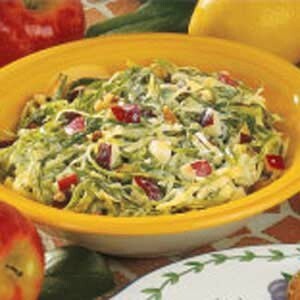 In a large bowl, toss the cabbage and apples. Pour over cabbage mixture and toss to coat. There are 4 comment(s) for this recipe. I will try that sounds good. Sumera, I tried your receipe, it was delecious. You know your salads were always good in the past as well !!! !